The University will begin renovation projects this spring that will update its two main athletic structures on campus, UT Vice President and Athletic Director Mike O’Brien announced Friday. Renovations to the east side of the Glass Bowl stadium will include new concession facilities, rest rooms, entry ways and a ticket booth, as well as an overall facelift to the façade near Stadium Drive. There also will be updates to the visitors’ locker room. A new FieldTurf playing surface also will be installed on the Glass Bowl field. Work on these projects is underway. 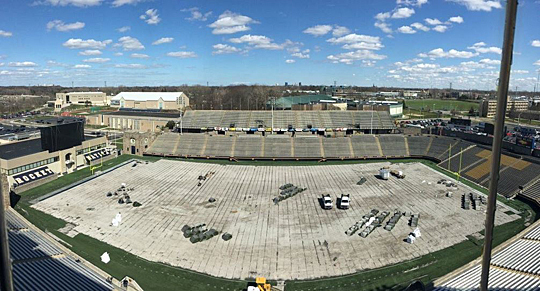 A new FieldTurf playing surface will be installed on the Glass Bowl field. At the same time, Savage Arena will undergo an expansion that will create new offices and work spaces for the men’s and women’s basketball staffs, as well as an expansion of the Joe Grogan Room. The basketball offices will be built at the concourse level on the south end of the arena, directly beneath the expanded Grogan Room. The Grogan Room will be expanded toward the south, substantially increasing its current size. The addition also will create the potential for a future training table that would address the nutritional needs of UT’s almost 400 student-athletes. This project will begin within the next few weeks. The two renovation projects, which are expected to cost about $6 million, will be funded through annual fundraising and other revenue sources. The Glass Bowl renovations are expected to be completed prior to the start of the 2016 football season, while the Savage Arena project will be completed prior to the start of the 2016-17 basketball season. This rendering shows what the new façade on the east side of the Glass Bowl may look like. O’Brien said that the two projects will address the most pressing needs for both facilities. “The east side of the Glass Bowl has needed improvements and updates for some time now, especially in the concession and rest room areas,” O’Brien said. “I’m confident that fans who sit on the east side of the stadium will appreciate the new amenities in that area. 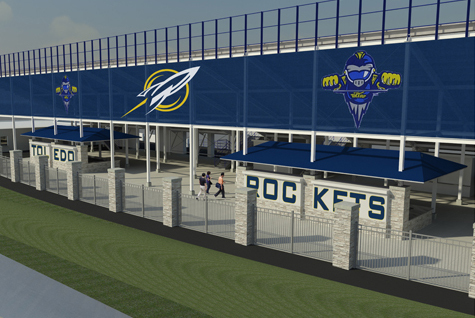 For information on how to become involved in the project, contact Senior Associate Athletic Director Dave Nottke at david.nottke@utoledo.edu. This entry was posted on Friday, April 22nd, 2016 at 3:55 am and is filed under Athletics, News .